Last year, I found that some of my students had a very hazy notion of cause and effect. Some of them didn't realize that causes ALWAYS come before effects. Think about how this affects their reading. When asked to find a cause for something, these students didn't know that they should start their search toward the beginning of the article. These students also had trouble distinguishing causes from effects. When asked to brainstorm possible causes for an event, they made lists of effects instead. Think about how this poor understanding affects their day-to-day interactions with other students! I posted a simple activity on TeachersPayTeachers. I happen to like the card activities that get kids up and moving. With this one, students get a cause or an effect, and then walk around the room to try to find the coordinating card. Then they decide who has the cause and who has the effect. It's simple, but it gets kids talking and moving, and is a nice introduction to the text structure. I've worked to refine and create some teaching tools for cause and effect. I posted a slideshow to introduce causes and effects over on Slideshare. It was fun to make--Aidan was a willing helper! Although now he wants to crack eggs on the sidewalk every day...I guess that was an unexpected effect. 1. Leave a comment below to share how you'd like to use these materials in your classroom or with your children. Be sure to include your email address or your blog link so that I can contact you. 2. I'll choose winners randomly at noon EST on August 10, and then email winners for their addresses so that prizes can be shipped. Be sure to share the link to this post with others at your school! I look forward to hearing from you. Here is a projectable book that introduces the text structure of cause and effect. Eventually, I'll format it for use as a regular book as well. I'm getting better with the projectable books...of course, it's helpful that the frogs at Kings Gap are so cooperative! This is just an introduction to cause and effect, of course, and isn't meant to be the literature that you teach. It would work well as a shared reading with a cause and effect graphic organizer. Are you looking forward to teaching text structure this year? I am…because I know that it’s important to give kids a set of blueprints for how to put together different kind of texts. As readers, we can use text structure to understand what the author is trying to say. As writers, we can help our readers by using a clear text structure that pulls the reader along the current of our ideas. It’s fun to introduce text structures by using different picture books. With younger students, this can be a whole class activity. The picture book can be a shared reading or a read aloud, and the teacher can make the text structure explicit by sharing how the text structure illuminates the main ideas. For older students, it works well to introduce the text structures, and then give them a variety of picture books to read in groups. You may want to put sticky notes on certain pages to draw the students’ attention to different features or transitions. Do you have some books that don’t seem to fit in a text structure? Share those as well! Kids need to see that many texts don’t have one and only one text structure. Writers don’t usually say, “I’m going to write something using the Cause and Effect Structure!” Instead, a writer begins with an idea, and then uses the text structure that fits to explain that idea. Many writers move skillfully from one text structure to another as the text unfolds. These books are just a sampling of what is out there! This is a very simple book about the life cycle of the house spider. There are many others in the series that follow the same pattern. Many “through the ages” books are in chronological order. Most biographies are written in chronological order. I happen to like the illustrations and the writing of this one. Like many animal books, this one tells the story of an animal throughout the seasons. The chronological order is easy to follow. Within this pattern, Cherry also uses some paragraphs of other structures to explain information about the wood thrush. Very simple, this board book shows objects and what comes next. Many science texts use cause and effect structure to show how things happen. Sadly, this book is out of print, but it’s still available in many libraries. It tells the tale of giant toads in Australia. They were brought to control insects, but their arrival had many unintended effects. Lots of great details that kids love. As you will notice, most problem/solution books include elements of chronological order and cause and effect as well. After all, as the author is writing to explain a problem, the issue of what caused the problem comes up naturally. This book tells how house sparrows came to Philadelphia to solve the problem of inchworms that were eating the leaves on the trees. Unfortunately, the book does not address the ensuing problems that the sparrows caused! My favorite for teaching text structure. This book shows how the same book can have elements of chronological order, cause and effect, and problem and solution all woven together. A very simple introduction to problem and solution, this is a lovely book! Not many books are written entirely in compare and contrast order. More frequently, an author will use compare and contrast to explain how two similar things are different, or to introduce a new idea by comparing it to a known one. This book uses a second-person approach, addressing the reader to ask, “Are You A Grasshopper?” Through it, the author compares and contrast grasshoppers to the human reader. This book contrasts the life of a child of today with the life of a child years ago. I did find it to be a little overly sentimental in its look at the past, but the compare/contrast structure is there. Many other books by Steve Jenkins follow this structure as well. Don't forget these! Arranging text according to the alphabet is a text structure, although I'd have to argue that it is not the most effective. One of the best I've encountered is Wendell Minor's Spirit of 1776. Toolkit Texts from Heinemann. Lots of different articles at different levels. This is a good source of lower level text. This is an overview of text structure that is suitable for professional development. Young students and ELL students may not know the meaning of the word “structure”. The metaphor of “text structure” will not mean much to them! Use this presentation to build an understanding of this important word. I love surprise stories. I love it when an author strings me along to think that things are going to unfold in one way, only to have them unfold completely differently. For very young kids, Kathy Mallat’s Trouble on the Tracks is a good example of this kind of book. As an older reader, I loved The Thief by Megan Whalen Turner, because the first person narrator is hiding something the entire time. But I need to be cautious in using too many surprise stories with my students, because these kinds of stories are often the exception instead of the rule. For every book that has a blinding surprise at the end, there are at least five others that unfold along more predictable lines. It’s far more likely that a reader will encounter a story that leads to a deepening and refining of predictions. I wrote “The Magic School” story to try this out with students. (It showed up as a presentation at Slideshare, but it's really a Word document, formatted to copy double-sided) I wanted a story in which small clues lead to larger clues, a story that would be supportive to students as they make inferences. I embedded the questions to help readers pause and think at certain spots. It's bare of illustration because I wanted to give readers more of an experience in visualizing from scratch. It's set in a familiar location, with familiar items, so they should be able to create the pictures in their heads. When I used it with a small group of students, “The Magic School” worked wonderfully. The students liked being able to write on the books, and the questions served their purpose. It was interesting to see which students could use the clues from the beginning of the story to help them figure out the events—for example, making the connection that the librarian had been the largest flower in the enchanted library. Some of the students picked up on it intuitively, while others needed coaching to recognize that, usually, the details in a story are there for a reason. The flower at the top is jewelweed, blooming abundantly now around wet areas. It has a surprise ending--the seed pods will pop when you touch them, leading to its other name, touch-me-not. I started making Powerpoints last fall, when I inherited a (slightly) broken LCD projector. I figured out the secret to making it work, and I haven't looked back. With two children and a somewhat hectic lifestyle, I find that Powerpoints help me to keep my teaching points organized and my brain in order. One of my first presentations, "Understanding Text Structure" is nearing 3000 downloads at TeachersPayTeachers.com. It's available for free at http://www.teacherspayteachers.com/Product/Understanding-Text-Structure-Powerpoint. It's an overview of the different common text structures, with examples and explanations. Lately I've started making some presentations for younger readers. Instead of emailing them to workshop participants, I've been experimenting with posting over at Slideshare.net. The latest one is called "Comparing is a Kind of Thiknking" and shows students how to compare. Here is the link: http://www.slideshare.net/elkissn/comparing-is-a-kind-of-thinking. Downloads are quick and easy. And, in between cross-posting and blogging and getting into Web 2.0, I've also squeezed in visits to our local state parks...the frog picture on this post is from Kings Gap State Park, where Zachary counted 33 frogs from one location. Pretty neat! It was one of THOSE car trips. Living in a rural area, we often find ourselves on the road for an hour or more doing errands and getting what we need. On this day, our two sons just couldn’t agree. “Let’s play with the sea turtle,” Aidan said. He pulled up a stuffed sea turtle. At four, he pretty much expects to be in charge of the world. “It is a sea turtle!” Aidan insisted, his voice veering toward whining. “Well, no, it’s not,” Zachary said. The argument went back and forth a few more times, voices getting louder. Finally, I decided to intervene. Both boys were quiet as they listened to the story. Dragons and knights are big hits in my household. I sighed as my idea went up in smoke. My husband looked over. “You can’t eat them both up,” he reminded me. And I was feeling rather dragonish. Well, I thought, as I listened to them arguing the relative merits of both knights, at least now they were arguing about something different. Then I listened a bit more carefully. I decided to intervene again, but in a slightly different way. "If you stop arguing RIGHT NOW, we'll stop at Fuller Lake and look for creatures in the creek." That did it. No story, no theme, no great plot, just the promise of feet in a creek and the hunt for creatures. "Maybe we'll find some lobsters!" Aidan said. "Well, Aidan, they're not really lobsters in the creek," Zachary said. "What we find in creeks are really called--"
"Zachary!" my husband and I said at once. "You know, Aidan, you can call them lobsters if you want," he said, magnanimously, bringing our car trip to a somewhat peaceful end. First: A picture of a hickory tree over at Oakside Park, just a mile from our house and easily walkable with a new fitness trail. In a recent workshop, several teachers shared with me that their administration discouraged them from using retelling in the classroom. Apparently, they were told that by the intermediate grades of 4-6, they should be focusing on summarizing, and should not use retelling at all. I think this is misguided. Telling teachers to avoid retelling keeps them from a wonderful strategy that helps students to understand text, make connections, and build background knowledge. I think that retelling is a suitable activity for all classrooms, from kindergarten and up. Here’s why. Summarizing gets all the press as being a great thinking strategy. But having kids write formal summaries for every text is overkill (and just plain mean!) In real life, readers are far more likely to retell a text than to write a summary to share. Providing students with opportunities to retell every text, and write formal summaries of SOME texts, is more realistic. When students retell, they are using many representations. They are talking, they are listening, they are moving little figures around to show the action, they are pointing to pictures. These representations will help them to remember not only the information and details from the text, but also the key points that a retelling should include. Retelling helps students to make inferences and build connections. If you doubt this, pay attention to your own processes as you retell a story or a nonfiction article. Retelling brings the ideas from the text into the working memory, where they can be linked to old information to form inferences. When students retell together, they can pool their schema and learn from one another. 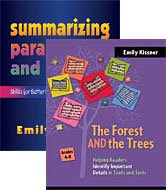 As students work on summarizing, they struggle with figuring out which ideas are important. Their summaries often go on and on, even getting to be as long as the original text. (And they look so proud when they show these super-long summaries to you!) It’s easy to help kids figure out what’s really important with speed retellings. Can you retell the story in 2 minutes? One minute? Which ideas should you leave out? Which do you have to include? I hate a silent classroom. There is something about it that just makes me edgy. So I like the productive hum of retelling. Kids like it, too. So, just because your students are past the primary stage is no reason to give up retelling. Try it out in your classroom! With the bee balm in bloom, there are butterflies everywhere! I can't escape from school. As I sit on the beach, dig a sand castle, or peer into a stream to catch creatures, teaching thoughts just enter my brain. One of the thoughts was about how I can use projectable books in my instruction. I like the idea of projectable books for several reasons. Not only do they make text visible to all of the students, but they also allow us to highlight key features. I'm working my way through several questions about projectable books. How do I deal with the issue of students reading at different rates? Would timing the slides be useful, or would it leave some kids behind? Where can I find projectable books? Will they be useful in the long term, or will the novelty wear off quickly for students? Other projectable books can be found at Reading A-Z.com. What do you think? How do you plan to use projectable books this fall? Steve Jenkins books at Kohl's! I love to check out the new $5 books that Kohl's sells by the cash registers. I was thrilled to see this month's choices, three books by Steve Jenkins. This author creates books that include lovely artwork and true animal facts. There are three books available, plus stuffed animals to go along with them. But get them fast...I learned this lesson with their last offering, Duck Soup, which I missed. Biggest, Strongest, Fastest: Full page collages show animals that break records for speed, strength, and size. What Do You Do With A Tail Like This? : Great book for teaching adaptations, with facts about how different animals use their ears, eyes, and of course tails. Actual Size: I've noticed that kids will pore over this book for hours...it shows pictures of different animals, depicting their actual sizes.